It’s always interesting to know what racquets the ATP professionals use. What is for example American talent Taylor Fritz racquet? Tennisnerd will hopefully provide some more insight. Taylor Fritz is one of the rising young stars on the ATP tour and is at time of writing ranked at 73 in the world. Taylor Fritz is sponsored by HEAD tennis and he is endorsing the HEAD Graphene Touch Radical MP . 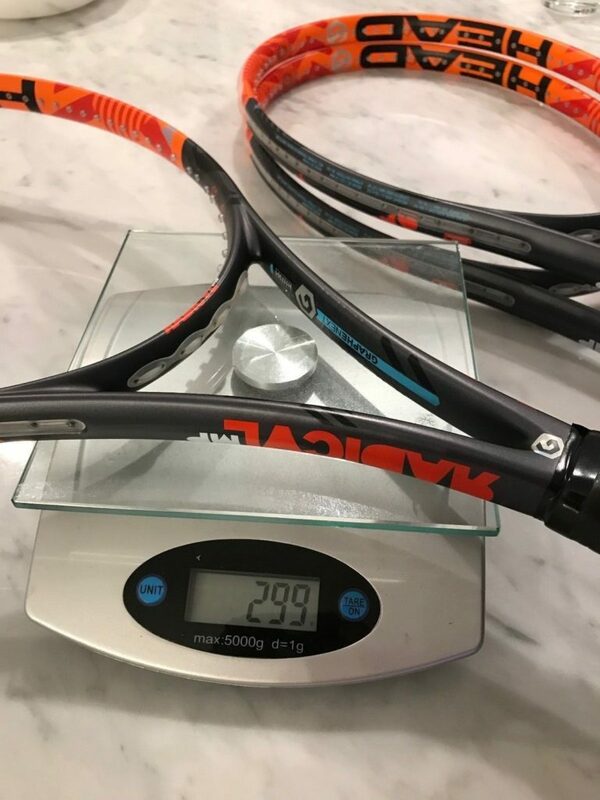 Taylor Fritz racquet is really the Head IG Radical MP with the pro stock code TGT260.3. Talking about Taylor Fritz racquet compared to the one he endorses, I would say that the IG Radical series is more flexible and control-oriented while the Graphene Touch Radical is stiffer and more powerful. This is the direction where tennis racquets are going and have been going for quite some time. But if you want a more flexible frame you can still find the Head IG Radical MP on Amazon. 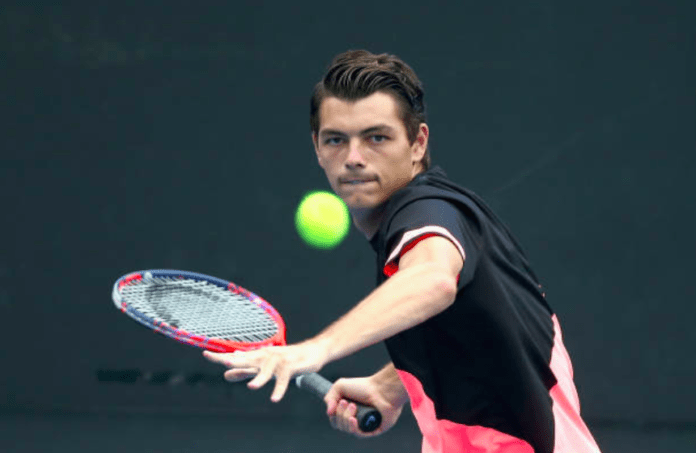 Taylor Fritz Racquet – Remarkably light? You can actually buy Taylor Fritz racquet, with this I mean his actual racquet, on eBay. One seller has listed three items, matched at 299 grams unstrung with some lead tape under the grommets in the hoop. This is remarkably light for a pro player racquet meaning that it’s around 315-320 grams strung. Very few players on the ATP tour uses a racquet this light, but if you have a fast swing speed and are good at hitting the centre of the racquet – it’s possible I guess. Also, the balance of the racquets are unknown, could potentially be quite head heavy since the original HEAD IG Radical MP racquets were about 3 pts HL unstrung and with some lead in the head they will be close to even balance. 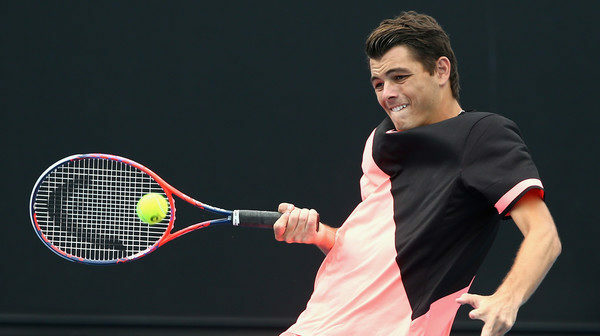 Taylor Fritz strings his racquet with the spin friendly and crisp string Solinco Tour Bite. He uses grip size four and from what I’ve seen he doesn’t use an overgrip. There is a story going around the forums that at the Sacramento Challenger in 2016, he gave the stringer two frames and was unaware that one was 16×19, and one 18×20. He had been playing both and didn’t notice a difference. This means that not all ATP pro players are gear heads, although many are. The most well-known gear junkie/tennis nerd on tour is Fernando Verdasco, who seems to tweak his setup constantly and play with a slightly different configuration in every tournament he enters. Taylor Fritz might not care so much about his equipment, but he sure can play some excellent tennis. At 20 years old he has a potentially very bright future ahead of him. He managed to reach the round of 16 in this year’s (2018) Indian Wells with a fine win against above-mentioned Verdasco. He has also shown that he is a fierce competitor with his deciding tie-break record of 11-1 on Challenger Tour level and above. If you’re interested in what racquets the ATP pro’s actually use…read this. Is Youtek any more comfy than Graphene Touch, not for me. I took out a freshly strung Youtek Prestige Pro and PP Touch today, both with TB at 54. The Youtek feels like aluminum, the Touch like plastic. I was shocked that the Youtek is so heralded and it’s at 67 RA. I thought Prestiges were supposed to be comfy? Granted I could have gone with a softer string, but the exact same string in the Touch works great. I can’t feel much of the ball with either, but I know my arm likes the Touch. I much prefer the feel of a Vcore or a PS, they seem organic. What’s the most comfy, greal feel Prestige? I am very surprised he can play with that… I have a Radical IG MP and, while it’s a very nice and precise racquet, it feels quite unstable and ‘moves” a lot when hitting hard or defending against big strokes. The best Youtek is the Youtek IG. The Youtek IG Prestige MP is used by MANY players on the pro tour under the pro stock code 293.2 and I used to play with it myself. It’s a nice stick! The best Prestige? Perhaps the iPrestige MP (PT57E pro stock code). They got the flex/stiffness ratio just right with that one. But the Youtek IG Prestige MP is not far off and you can find those quite cheap these days. I have the current touch PP and demoing the Touch MP and Mid. They seem to be made of different material. The beams are thiner and feel so solid. I have yet to hit other than a wall. Love the mass of the Mid but miss hit a bunch. It’s like this long egg. And even thought it’s 8 it’s HL it still feels Hh. I guess they put the mass up there. The MP feels wonderful, really flexy, can whip the ball. But sometimes feels detached and need to add leather handle to not feel too head heavy. But then might be to heavy for servers. I’m playing the youtek stock with oh and do t feel the need for customization. Same with touch PP, I just put two OG. YTK PP iit very precise, but feels like it was made from an aluminum block. Does the IG help with this? Really surprised at how easy the Touch PP plays. Bombshell serves, stable with returns, volleys and pickups. There is bit of pop to help in defense but don’t feel I need to over hit on groundies. Have to aim for bigger targets it seems, but good for a match and very comfy. So will the IG PP be that much more comfy than the regular YTK? I don’t see how these are consider arm friendly at 67 RA. What’s a non grapheme prestige that plays under 65 RA?